my sister susan is visiting from san francisco because my godnephew grant and godniece summer just turned one and they had a big party today! which by the way was great, i haven't seen them in quite some time, and they are both just so adorable! i know, what kind of godmother am i?! well, i suppose just a busy one, but i will try to be better! anyhow, back to my story...typically we would go somewhere like supreme dragon so susan could get her chinese comfort food fix, but my dad gets sick of eating there so we decided to eat at garden cafe, which is actually right next door to supreme dragon. i have only been to this location a handful of times, and on one occasion i ordered the spaghetti, which i have had many times at other locations, but this one in particular had put tons of rosemary in the sauce, which i cannot stand! rosemary is one of my least favorite herbs to eat because it is so strong that it overpowers everything! but there are times when i've had it and its just a subtle hint of rosemary, i don't mind it at all and can enjoy the food. so of course, i thought, i'm totally going to avoid the spaghetti and i'll get my other favorite dish from garden, oxtail stew in red wine sauce...its usually simple and to the point, tender, rich and perfectly seasoned with large chunks of carrots. the perfect comfort food on rice...nothing crazy. my order arrives and it had tons of large black flecks all over the carrots and in the sauce...i wondered, did something burn on the bottom of the pot and then get scraped up and mixed up in the sauce? i didn't bother looking closer at the sauce and thought to myself, just try it and see what it tastes like. as soon as i put the first baby piece of oxtail in my mouth, the flavor that hit my tongue first was...yup...you guessed it! ROSEMARY! wtf!?! i couldn't believe it!!!! there is something to be said about going to chain restaurants that has a certain element of comfort. why is that you ask? well, many times i go to them because i know exactly what i am going to get, the recipes are usually the same at each location, so i know that i am going to get fairly consistent tasting food. so when i got the rosemary oxtail stew, i was besides myself. i haven't even told you about the fact that it took them at least 10 minutes before our server came to out table to take our order or even acknowledge us. then it took them at least another 15 minutes before we even got our drinks! my dad ordered water, i requested hot water with lemon and honey and my sister had ginseng tea. these aren't even hard requests for crying out loud! so you can understand how this was already becoming a bit frustrating. we didn't say much, just waited patiently. ok, back to the food. i feel like this is incredibly long, but i'm not even done with the rest of our meal. i will quickly add, my dad was very satisfied with his beef chow fun. continuing on...susan ordered shabu shabu, mind you...all of you who have eaten shabu shabu before know that everything is raw and you have to cook it yourself. how hard is it to assemble a bunch of raw vegetables and meat? i kid you not, we had our meal, my nasty rosemary stew and my dad's satisfying beef chow fun. the pot of soup had come out earlier when our food came out, but the raw stuff hadn't. so we waited...i had my discussion with our waitress...continued to wait. she walked back and forth, never once asking us how we were, if we needed anything or that the rest of the shabu shabu stuff was coming out. my dad and i finished eating...about 15-20 minutes later, still nothing. finally i stopped on of the workers and told her that we were still waiting, about 5 more minutes passed and finally another server said it was coming. at this point, susan just wanted to cancel her order, finally at least 30 minutes later, all of her raw components come out. the meat is totally frozen, with freezer burn, the udon noodles (advertised as fresh handmade japanese noodles) frozen solid in a block, and she felt that the tofu was frozen at one point too. *sigh* honestly, how freaking long does it take to assemble, tofu, enoki mushrooms, kabocha squash, whole shiitake mushrooms, napa cabbage, a frozen block of udon and frozen beef rolls, which were all stuck together. you can see the frost bite on the noodles and the meat! 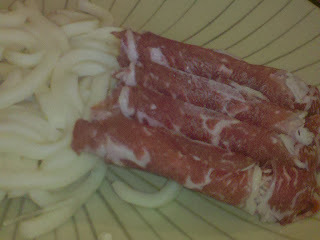 and i didn't get a picture of it afterwards, but i made my dad put that whole block of rolled meat in the hot pot, and when it finished cooking, it was STILL stuck together, all four of them like little pigs in a blanket! no one roll (piggy) wanting to break away from each other! my sister actually ate a couple of the rolls and was so disgusted by it because it tasted funky she had to stop. the texture was weird (these are her words) and she did not have a good feeling about eating it. our server NEVER came back to our table once to check on us...wow! talk about the CRAPPIEST service EVER!!!!!!! i don't even know if i have completely articulated how bad our experience was here tonight! well, believe me, it was crappy and the chef takes such basic foods that are usually so simple and delicious and puts his own very disgusting and unappetizing spin on it. the service was beyond ridiculous even my dad said he would NEVER come back to this location either. and truly, that says a lot, because my dad usually doesn't care. what a disappointment...i will NEVER recommend this Garden Cafe location in rowland heights to anyone. i'd rather drive all the way to arcadia just to eat at garden. so, if any of you enjoy being ignored at a restaurant, this could be the restaurant for you. but i highly doubt it...so save your money and your time and when you're in the mood for some terrific oxtail stew in red wine sauce go to the arcadia garden cafe. Sounds bad enough for me Doreen, I wont give them my business either. Thanks for the heads up in advance. you're welcome! so glad you found this helpful. but you should definitely check out the arcadia or monterey park locations.